As so many personal style bloggers out there, I L-O-V-E fashion and I love clothes. Too bad my wallet doesn't share my passion. So every now and then (read: almost every week) I'm looking for new online web stores to satisfy my need of having clothes. Shopping online keeps my husband sane and my wallet happy. That is pretty much a win-win situation right? In this post I'm sharing some images from an UK based online website featuring plus size clothes for women: Marisota. I've been living in the Netherlands for 16 years and I still get surprised by the cold during winter. Hey?! What can I say: "you can take the girl out the Caribbean, but you can't take the Caribbean out of the girl." So naturally these knitted cardigans and coats caught my attention. And I couldn't help but to fall for their 40's inspired lady like section. 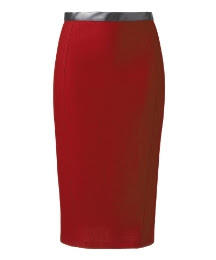 I'm loving the red pencil skirt. As a full-figured woman myself, I don't think we should hide our bodies. Actually, no woman should, full-figured, boney skinny, boyish, curvy. Show what your momma gave you and show it with pride. Back to the red pencil skirt: besides wearing her in a vintage feminine way, I definitely would pair the skirt with a black leather biker jacket. In my opinion the jacket brings some edge in the outfit, perfect for a night out. What's your favorite look or piece?